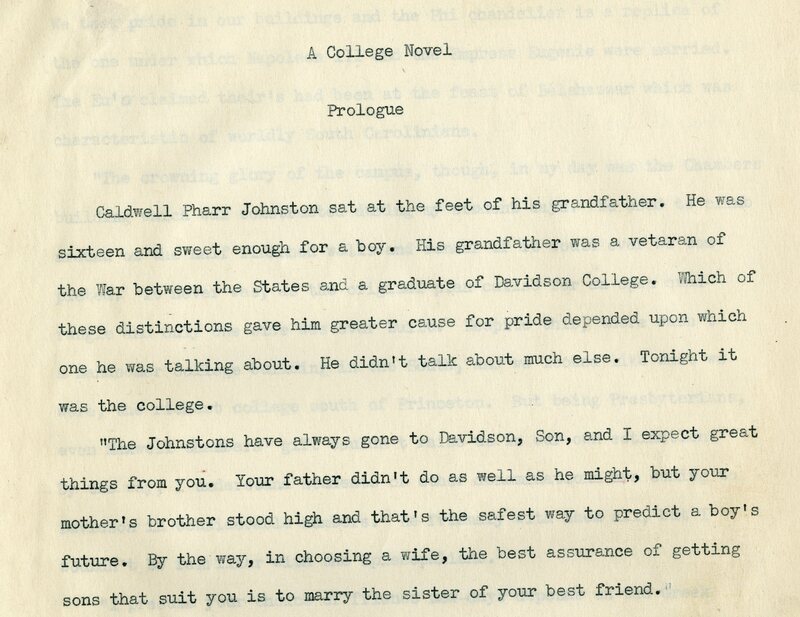 Nearly 100 years ago, on January 18th, 1915, Davidson College’s fledgling Blue Pencil Club turned into the Blue Pencil Chapter of Sigma Upsilon, a Southern literary honor society. 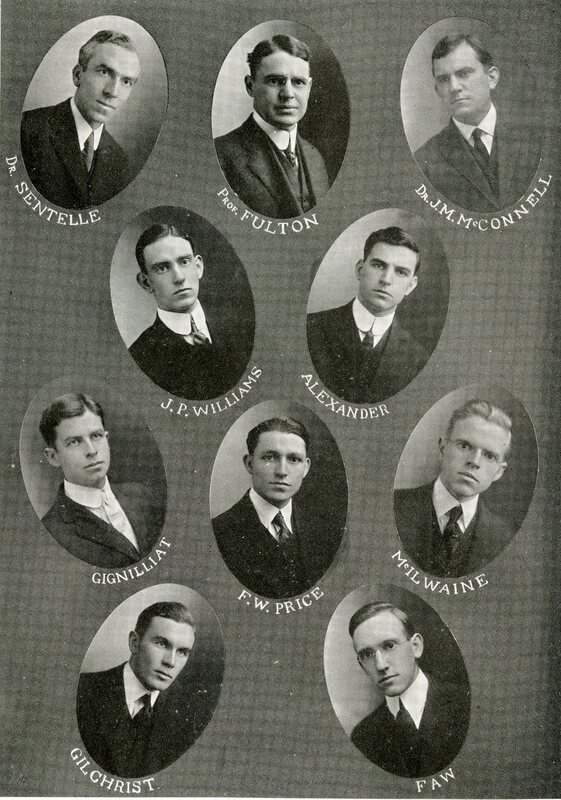 The seven founding members included five of the founding Davidsonian editors (Francis Wilson Price, William Andrew McIlwaine, George Warren Gignilliat, James Enoch Faw, and John Payne Williams), as well as the Poet for the Class of 1915 (John William Stuart Gilchrist), and the editor-in-chief of The Davidson College Magazine (Uhlman Seymour Alexander). The founding members of the Blue Pencil Chapter of Sigma Upsilon, including faculty members elected during the first meeting in January 1915: Dr. Sentelle (Class of 1894, Professor of Religion and Philosophy, later Dean of Students), Dr. Fulton (Professor of English), and Dr. McConnell (Class of 1899, Professor of History, Economics, Mathematics, and Latin, later Dean of Faculty). The founders stated that “the object of the club shall be to promote more effective literary work among the students” of Davidson, and that membership would be “based upon literary ability in it’s broadest sense.” The members also voted to publicize the organization in The Davidsonian, and at a meeting the next month, voted that members be required to produce two papers per year for the Blue Pencil Club for possible future publication, in addition to leading literary discussions. The minutes from March 8th, 1916, provide insight into what a typical meeting in these early days was like: after a vote on new members, “a Motion to admit women into the Club was unanimously voted down,” the Blue Pencils decided to pay $15 to get a club picture in Quips and Cranks, and “the new members each read a two minute quotation from some Shakespearian [sic] character in costume… They then took initiation ceremony and the social side of the club received emphasis.” Meetings frequently featured “stunts” (such as new initiates having to compose and read aloud essays on the subjects of “Is it a Submarine? If so, Why?” and “‘A game of golf as played on a bird propelled ocean liner,’ with all of the details, and he was arrayed in the costume of a count of the time of Elizabeth.”), burlesques of the faculty, and pastiches and parodies of famous authors. 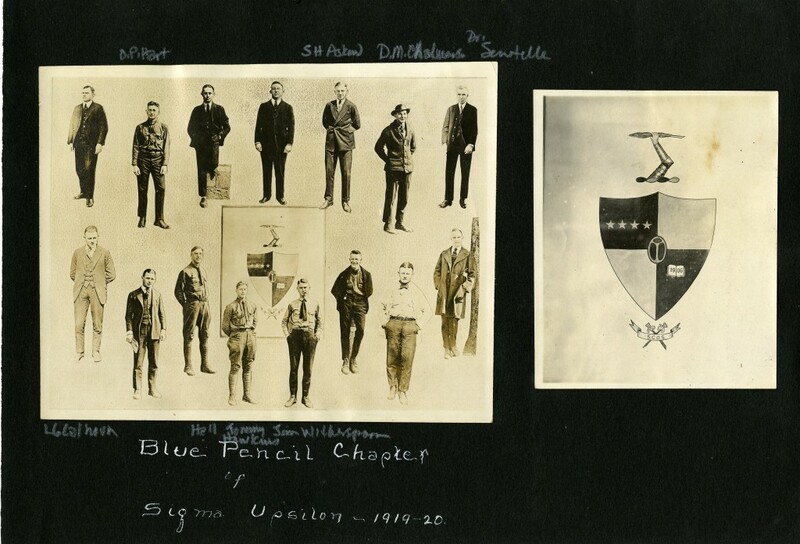 A page from Hugh C. Hamilton’s (Class of 1920) album, showing members grouped in front of the Sigma Upsilon seal. The Blue Pencil Chapter continued its reputation for japes and prolific writing until its dissolution in 1970. William C. Doub Kerr (Class of 1915) established the Woodrow Wilson Creative Research Award and Willa Cather Creative Writing Award for members of Sigma Upsilon in 1937, and wrote to Cather that year, as Jan Blodgett wrote here on Around the D back in 2009.
Notable Davidson alumni who kissed the mystic scarab include: Sam Spencer (Class of 1940, President of Davidson College 1968 – 1983), Jason McManus (Class of 1956, former Editor-in-Chief of Time Inc.), and Charles Wright (Class of 1957, U.S. Poet Laureate), and many English and History professors had been inducted as faculty members. In the course of going through our archival collections on the Blue Pencil Club/ Chapter, I discovered so many former members who went on to teach here at Davidson or other academic institutions – who else have we missed that enjoyed ice creams and secret initiations?